Applaws offers complete and complimentary foods. Lifestage ranges are also available in both wet and dry foods and are created specifically for kittens or puppies and senior cats or dogs (7 years and over). 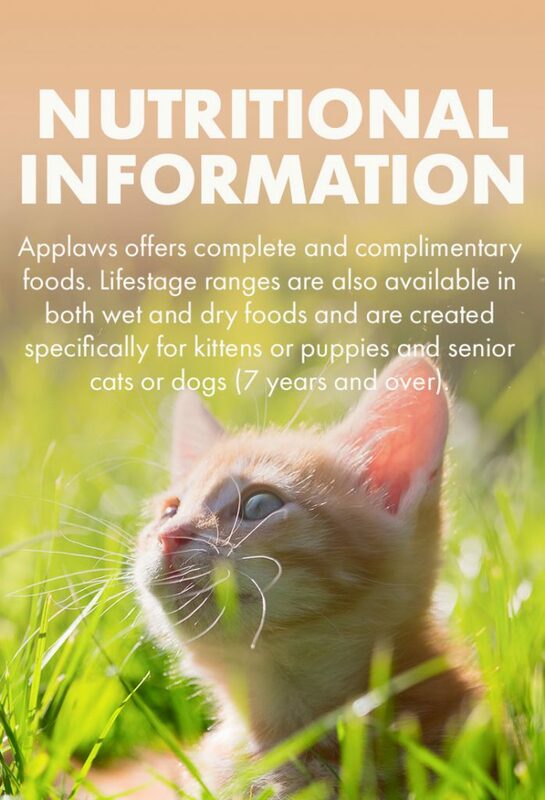 We’d love to share with you the nutritional benefits provided by the ingredients in Applaws food. Here’s an A-Z of our ingredients used in both our dry or wet food and the nutritional benefits which can be found when you add Applaws natural cat or dog food to your pet’s diet. Sun-cured Alfalfa Extract carries a natural supply of vitamins; and is an important source of natural, insoluble fibre, that aids digestion and helps promote natural bowel movements. Bioflavonoids are natural antioxidants that help fight cellular ageing, for a more active and better quality of life for a longer period of time. Brewer's yeast is one of the best sources of the B vitamins. These vitamins are necessary for carbohydrate, fat and the metabolising of protein. The vitamin B complex consists of eight water-soluble vitamins. The B vitamins work together to boost metabolism, enhance the immune system and nervous system. B Complex maintains the health of skin, coat, eyes, mouth, liver and muscle tone, encourage cell growth and division, and maintains muscle tone in the gastrointestinal track and other benefits to your pet's body. The B Complex contains: B1- thiamine, B2- riboflavin, B3- also known as niacin, B5- Pantothenic acid, Vitamin B6- pyridoxine, B7—also known as Biotin or vitamin H, B9- folic acid and Vitamin B12- also known as Cobalamin or Cyanocobalamin. Carob is a natural bean pod which is dried in the sun; it is rich in natural calcium for good teeth and bones, and helps add a luscious natural flavour which dogs love. Carrots are rich in dietary fibre, antioxidants and naturally occurring minerals. They get their bright orange colour from beta-carotene, which is metabolized into vitamin A. Lack of Vitamin A can cause poor vision, including night vision. Whole natural chicory root is a proven prebiotic which promotes healthy digestion. It serves as the "food" that the beneficial bacteria which are present in your dog's intestinal tract need to flourish and help keep your dog healthy. 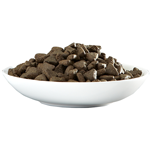 The benefits of feeding a dog food containing chicory root include increased nutrient absorption, aid digestion, and support of the immune system. Chicory contains oils which have proven effective at eliminating intestinal worms. While other pet food companies have been known to use less expensive chemicals and artificial preservatives (such as BHA, BHT and Ethoxyquin), Applaws only uses a high quality blend of citrus extracts that help to naturally preserve the freshness of our food. Other companies can hide these chemicals and preservatives under terms such as 'EU approved preservative' or 'Antioxidant' on the label. Applaws refuses to use these ingredients, instead our unique blend of citrus extracts contains tocopherols, these are rich in natural Vitamin E which is what keeps our food fresher for longer. Coconut oil is a natural source of special dietary fats which can help older cats or dogs in the anti-aging process by keeping them mentally active for longer, this is why they are a key feature of Applaws Senior. Medium Chain Triglycerides (MCTs) fats from Coconut oil are efficiently converted to fuel for immediate use, rather than stored as a fat. Cranberry extracts help to maintain healthy skin, promote a shiny coat, support a healthy urinary tract and support the immune system. Dandelion contains luteolin which is a flavonoid thought to play an important role in the body as an antioxidant. These act as a free radical scavenger helping to remove harmful or damaged cells. The active antioxidants can also defend and strengthen the liver and help with the digestive system. DHA constitutes the ‘building blocks’ of the brain, which is why it’s really important for cats and dogs of all ages to obtain a rich supply. DHA can support the development of the brain as well as normal eye function and vision. EPA is an essential nutrient and is considered to be one of the single most vital nutrients in the functioning of the brain and nerve stimulation. Fennel Extract can help reduce flatulence in some dogs and can help reduce bloating caused by digestive disorders. Extracts of fennel seed have been shown in animal studies to have a beneficial effect on improving eyesight. Fennel Extract also acts as a natural flea repellent! 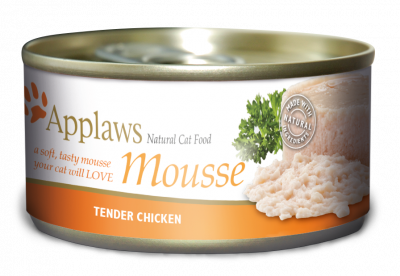 Applaws uses a range of sustainable fish species in our wet and dry foods; including Anchovy, Mackerel, Ocean Fish, Tuna, Salmon, Sardine and Seabream. All are an excellent source of Omega 3 & 6 fatty acids to help your cat maintain a lustrous silky coat and helps prevent from flaking or irritation. These omega oils are also a source of natural DHA & EPA. Our fresh chicken mince includes proteins from the chicken’s soft internal tissues, which in addition to the dry chicken meat, helps to provide the maximum level of amino acids which your cat or dog requires to maintain long term good health. In its simplest and purest form, this is chicken meat with the water and fat removed. 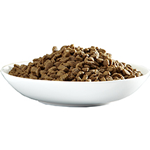 It is a good source of concentrated protein, which is nutritionally excellent for your pet. Applaws does not use feathers, beaks or feet in our chicken meal. Mango is an excellent natural source of vitamins A and C.
Legally, to use the term ‘Meat and Meat Derivatives’ on the labels of pet food, you are not required to have any meat whatsoever in the product. Whereas many companies use this term to hide their true ingredients, Applaws will never use this term, as we only use skeletal muscle meat such as chicken breast or fish fillet. Nutritionally, muscle meat provides an excellent natural source of taurine, arginine and lysine which are known as essential amino acids. They are described as “essential” because your pet cannot synthesise them in their own body, and must consume them from their food. Mussels are a natural source of Vitamin B12, Selenium, Zinc, Vitamin C and Omega 3. Natural Cellulose Plant Fibre is an excellent source of fibre. Not only does it enhance digestion and help to maintain colon health, it also reduces fur balls as it aids in the break down of any build up of cat hair in the digestive system. Oregano is high in antioxidant activity, due to a high content of phenolic acids and flavonoids. Additionally, oregano has demonstrated antimicrobial activity against food-borne pathogens. Paprika is unusually rich in vitamin C; the capsicum peppers used for paprika contain 6-9 times as much vitamin C as a tomato by weight. The extracts are also packed with many natural antioxidants. Peas are a natural source of the antioxidant Glutathione, which is important for many functions in the body, including regulating immune response. They also contain magnesium and phosphorus, which contribute to healthy blood, bones and muscles. Peas also contain nutrients such as iron, potassiam, vitamin A and vitamin K, as well as antioxidants such as flavonoids, the carotenoid lutein and polyphenols. Peppermint can help relieve digestive disorders such as flatulence and upset stomachs, it can also improve your pets effectiveness in digesting fats, therefore preventing weight gain. 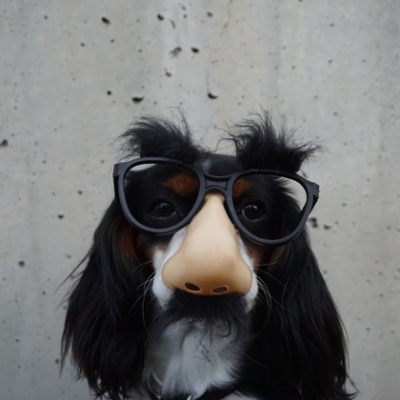 It can also help to remove toxins from the body and neutralise those unpleasant doggy smells that come through the coat but originate in the stomach. Potato is a low allergen source of both protein and carbohydrates; we use them as a natural way to hold the ingredients together during cooking, forming a crunchy kibble which is great for your cat or dog's teeth and gums. 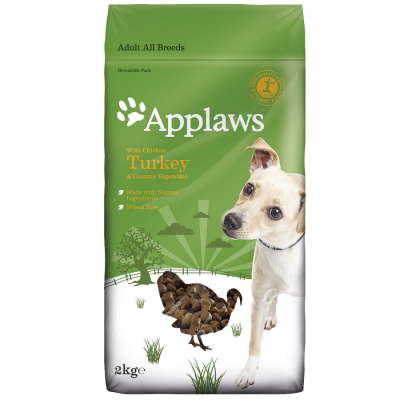 All Applaws kibbles are smothered in our unique chicken gravy, making our natural dry food the most delicious tasting food you can give your pet. Pumpkin is a fabulous natural source of fibre and can help to manage temporary stomach ailments such as diarrhoea or constipation. Rosehip is particularly high in Vitamin C, D and E, essential fatty acids and antioxidant flavonoids, that help to maintain good health. Rosehip powder extract is also a traditional remedy to help prevent the effects of rheumatoid arthritis. Rosemary is a perennial herb that is a member of the mint family. When distilled, the resulting Rosemary Oil acts as a fat-soluble antioxidant, that will work with the Citrus Extracts to help keep the food fresher for longer. Salmon Oil is an excellent source of Omega 3 & 6 fatty acids, to help your cat maintain a lustrous silky coat and prevent flaking and irritation. Seaweed & Natural Seaweed Extract create the foundation for an optimal metabolism, that is able to process and eliminate harmful toxins from the body, and ensure your cat or dog's food is efficiently accepted and digested. It provides important minerals and trace elements such as iodine, that contribute to a healthy thyroid function. Thyme is a natural prebiotic that aids digestion. Tomato is a natural source of Vitamin C, Biotin, Molybdenum and Vitamin K. It is also a good source of Copper, Potassium, Manganese, Dietary Fibre, Vitamin A (in the form of beta-carotene), Vitamin B6, Folate, Niacin, Vitamin E and Phosphorus. Turmeric contains natural fluoride and aids digestion. Yucca is a root vegetable containing a natural prebiotic that has a deodorizing effect, and helps reduce the smell of your pet’s stools. As more of the food is digested, there is less waste and less odour, you will also find that the stool is firm and easier to pick up for disposal. It smelt heavenly. Good enough for me to eat.